Orange Mod Works Black Friday sales! TODAYS DEAL: 11/25: Buy Unleashed stages 1 and 2 kits for Nerf Recon and get a FREE metal trigger PLUS a $5 Coupon for future purchases. The Super Soaker Electrostorm is a new battery powered motorised water blaster with an inbuilt water tank. It's compact- some would even say tiny though in turn it's also very solid and nuggety. 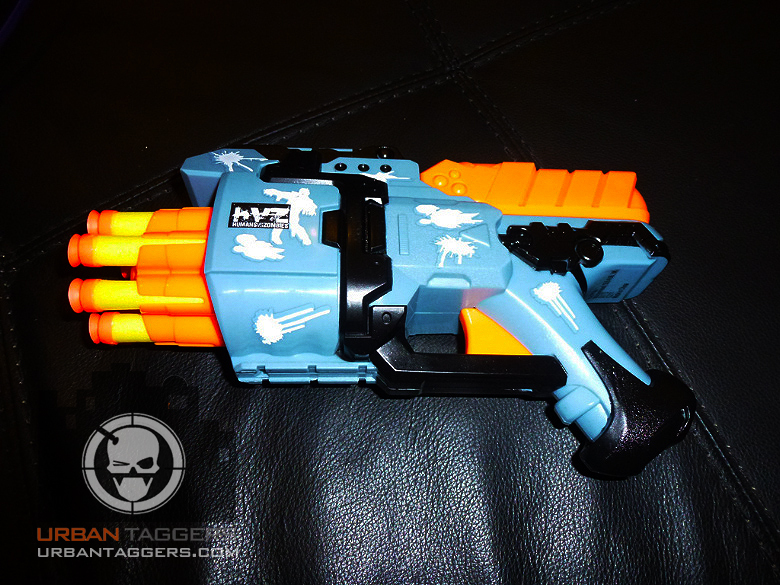 Maintaining the same paint job and finish as all of the new Super Soaker line, it looks like a decent lil' side arm that is a likely successor to last season's Super Soaker Point Break... but as another motorised water blaster, how well does it really perform? 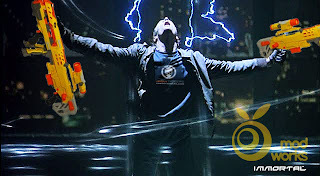 Super Soaker Lightning Storm: this looks familiar.. 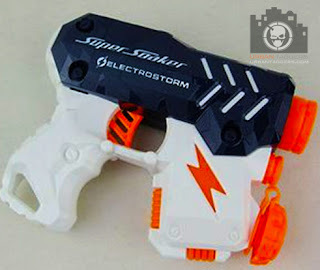 The Super Soaker Lightning Storm is a fully motorised water blaster from Hasbro and under the Nerf banner. It's big selling point is it is the "largest capacity Super Soaker" although this is against the current line rather than any past/vintage models of old; it comes with a large water drum that uses the same fitting as the water clips of the Tornado Strike and Thunderstorm so is compatible, only allowing for more water storage. Wait, did I just say Thunderstorm? Hmm.. doesn't this Lightning Storm seem awfully familiar now..
Fo shiz! 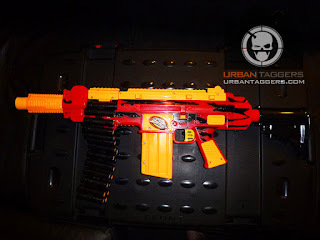 The Nerf N-Strike Stampede ECS is real, available, and Jerm from Nerf Mods + Reviews has got one. It's good to see they've changed the colour of the shield, bipod and the darts as well. More over at Nerf Mods + Reviews. 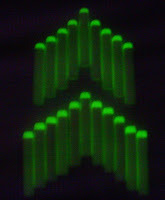 Glow-in-the-dark Streamlines: We've seen the light! There's been much speculation about the glow-in-the-dark streamlines that are to accompany the upcoming Nerf N-Strike Rayven CS-18. 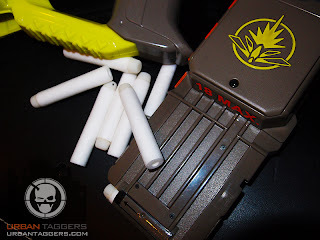 While I honestly thought it'd be treated as a gimmick and ignored, we've had so many comments on these darts that I guess it was worth writing and asking for a pack after they failed to arrive with the original blaster. 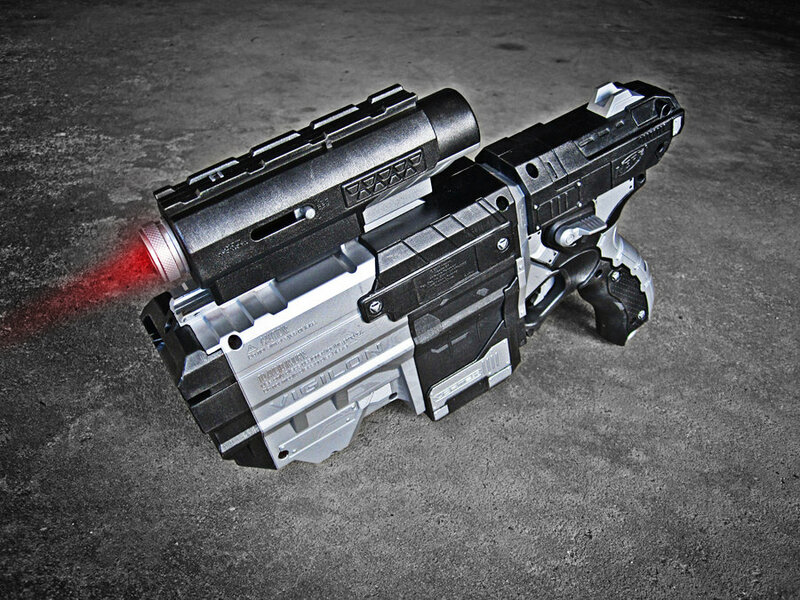 Unlike the previous Firefly REV-8, the darts are exposed to light via the clip as opposed to within the blaster itself, meaning for all intended purposes any clip based Nerf blaster can now be used.. well in the dark. Sakar Nerf 2GB USB drive: For the price of a real Nerf blaster.. It's a cute novel idea; this 2GB USB flash drive from Sakar is going for just under 20 bucks in the US. 20 bucks for 2 GB? 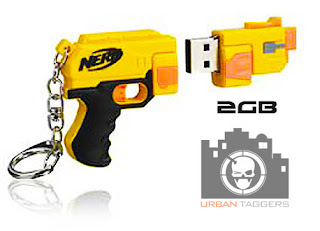 I always wonder why novelty flash drives are always using cheap and outdated tech; given a decent brand name 4GB flash drive goes for under 10 dollars these days, you really are paying for the novel blaster shaped design. 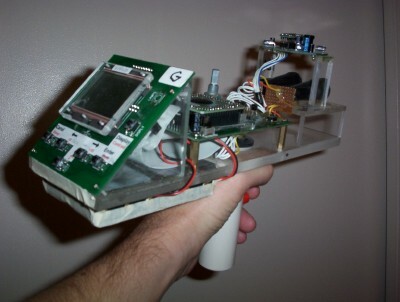 Not sure what blaster it's supposed to be either, and it doesn't actually do anything but, if you're a fan, available from Radio Shack in the US and no doubt. 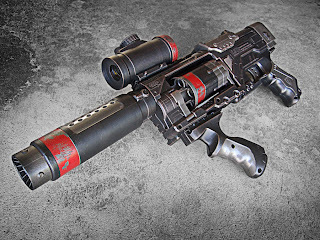 Apparently the upcoming Sakar Nerf Night Vision Goggles. I'm still unsure how good they will be given the RRP that came with the image was 19.95. Even Eyeclops gear wasn't that cheap. 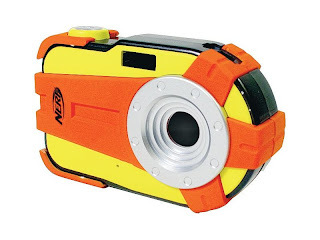 And in case you forgot, the other Sakar gear: apparently a helmet mountable digital video cam, a 2.1 and 5.1 mega pixel digital camera with social media software built in, the pocket DVR, a 2gb MP3 player, a multi function flashlight and some 1000ft capacity walkie talkies. Whoo hoo! The much anticipated Orange Mod Works Longshot Massacre "Immortal" Kit is now available for preorder. The kit comes in a collector's tin box, of which only a limited quantity is available. This one's pretty limited folks, so once it sells out, it will be never made available again. Also, to celebrate the once-in-a-lifetime date 11/11/11 they're running an 11% sale! Use the code "111111" to get 11% off your entire purchase. 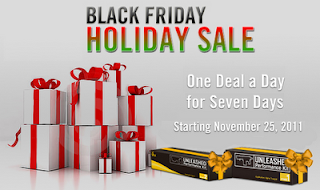 Also, just for funsies- get an additional $1.11 off of the Raider stage 1 kit. Use code "111111raider". 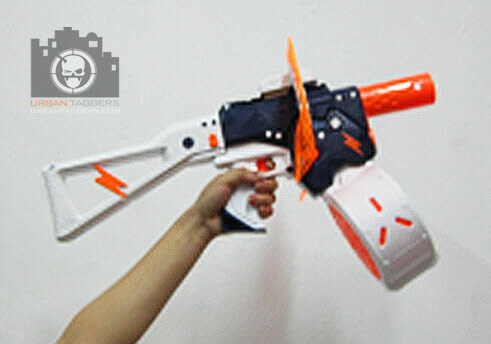 It's absolutely tiny, and came out of NOWHERE; the Jolt EX-1 is pretty close to being the smallest Nerf blaster available (The Secret Strike..mmm maybe smaller? But it doesn't really look like a gun!) and for what it is, it's pretty damn impressive. It's a single shot direct plunger piece that we really liked the look of.. did I mention it's absolutely tiny?! :P Thanks to Jerm from Nerf Mods + Reviews for this! Air Zone Quick Fire: Hoo Rarrr! The Air Zone Quick Fire is a Toys R Us exclusive motorised belt fed flywheel blaster that fires foam darts. 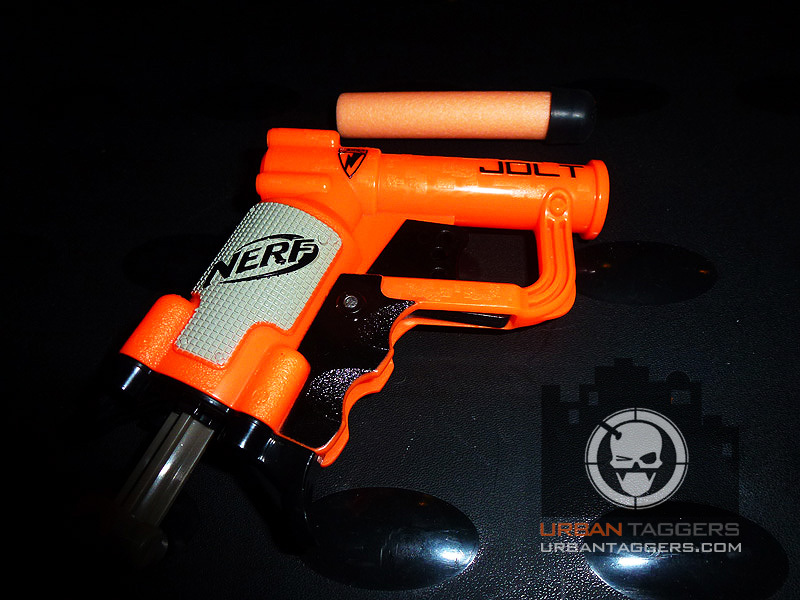 It's been in our radar for quite some time, and we finally got our hands on a unit to try out thanks to Jerm from Nerf Mods + Reviews. Air Zone have been bringing out some pretty sweet looking gear lately and we're pleased to report the Quick Fire is no exception. Ok, so it's a crap pic, but here's a sneak preview of the upcoming Super Soaker Lightning Storm that we posted about last month. Another TBA Super Soaker; the Super Soaker Electrostorm appears to be another battery powered blaster, but sans removable clip. I don't know a whole lot about it just yet other than some posts from some German sites, but I'll be guessing it'll be of similar performance to the Thunderstorm. 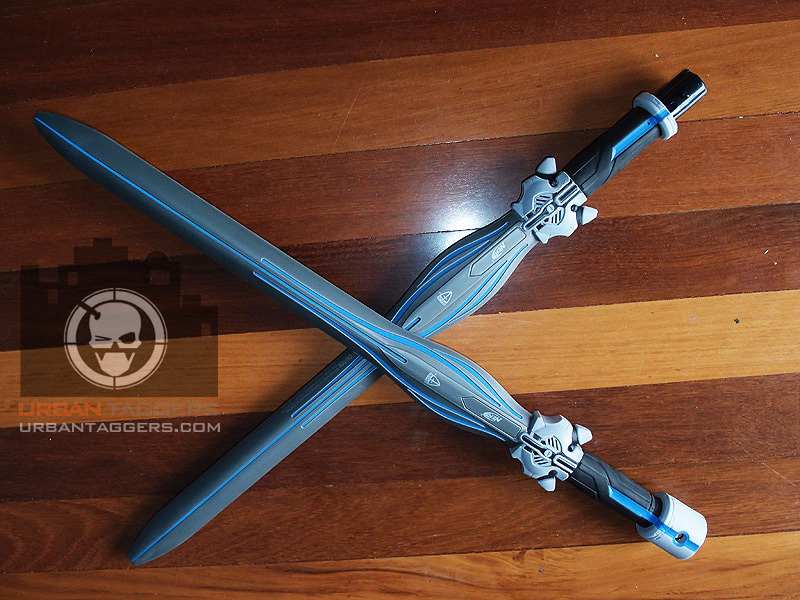 I do have to say, while the performances are pretty ordinary, new Super Soakers do look pretty damn cool. I can see how they'd be uber popular with the aesthetic modders..
Tactical Tag: New Lazer Tag: Update! A short while ago we touched on the development of an exciting upcoming laser tag line from the original developers of the Lazer Tag LTTO and Phoenix LTX systems. 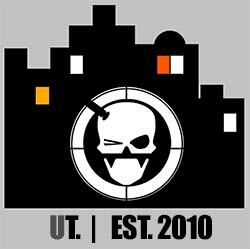 Bazookafied from Tactical Tag has been keeping up to date with the progress of the new system and has the latest intel on the blog, but essentially the new system will be fully compatible with LTTO and LTX, including LTTO-style LTAG, LTX-style TTAG (Team-1/2/3 LTAG), and hosted games. There will be several new game features exclusive to the new taggers such as being able to have one or more players start the game with no ammo, requiring players to find a power-up to be able to get lock-on information and the ability to have unlimited-time hosted games. More info below. The Nerf N-Strike Longstrike CS-6 has in the past had quite a bad rap, being considered an "all show no go" blaster; it is still today considered to be one of the best looking blasters Nerf have ever designed regardless of fan disapproval of its internals. In recent times its "all show" has been bumped up even more, with the "Whiteout series" finish that blew everyone away and now a new Sonic Series casing. N-Force doesn't have much of a presence in Australia, which is a shame because there is fair amount of cool stuff available States side. We picked up the Vendetta double sword pack which comes with two "blades" that can be used by themselves, or connected at the hilt to form a 4 foot double edged staff. The foam is thicker/denser than the rather woeful Shadow/Thunder Fury swords we originally picked up; and while lightweight, it does have a decent weight to it. Spotted on eBay and by a multitude of readers forwarding me this intel (thanks folks!) are the much discussed glow in the dark streamlines. Whoever's bought a pack can probably tell us (hint- someone buy it and tell us!) 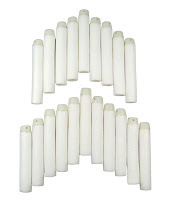 whether the whole dart glows in the dart or whether it's just the tips. Personally I never bothered attaching the luminous stickers to the sucker darts that came with the Firefly REV-8 and was fine with just the suction heads being the only thing that glowed. 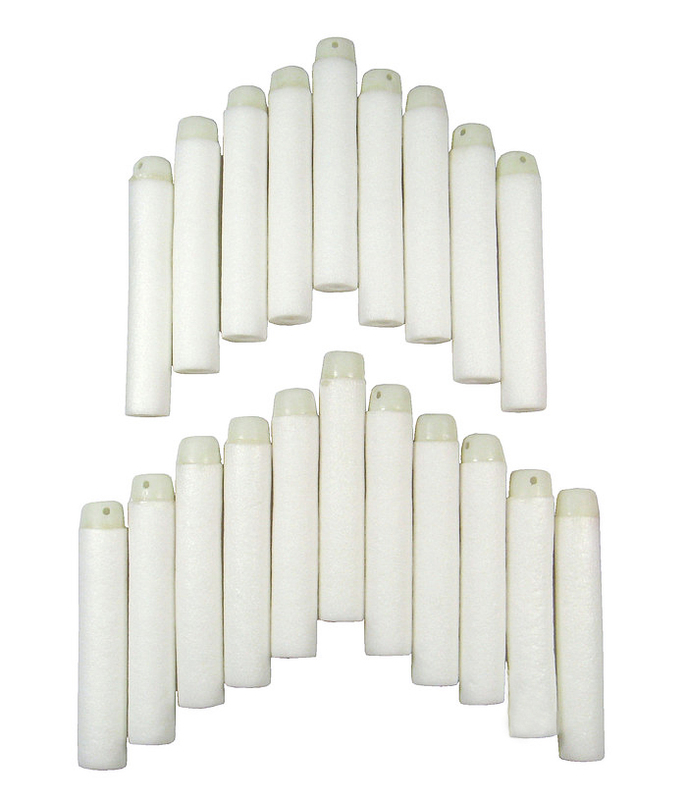 I'll suggest the same will be with these, but I've been proven wrong before so perhaps Nerf have managed to make the foam glow too? We'll see soon enough no doubt! 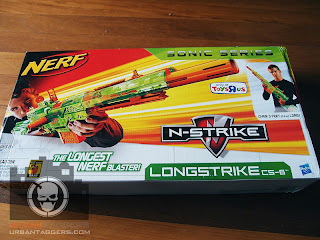 Rant: Nerf blasters in Terra Nova... cool. 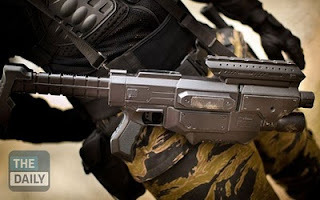 There have been a lot of posts on the web about the use of painted Nerf blasters in the new TV series "Terra Nova"; there have been Recon's, Nitefinders and Longshots with some of them more modded than others. I know it seems laughable to we Nerf affectionatos, but to be honest I don't see it being that much of a big deal. Those who aren't in the know (ie most people) wouldn't pick this, mainly because the whole thing about the N-Strike range is they all look so damn cool out of the box, and give it a decent spray job and some aesthetic shell mods and you've got yourself something that you can now say is as good as a television show prop! If you didn't know it was a Nerf blaster, the above pic looks pretty sweet as it is, and a prop built from the ground up (which are often mods of other replica fire arms and toys anyway) wouldn't necessarily be any more realistic or impressive looking. Some of the gear that comes out of Johnson Arms, Meandmuch and Nerfenstein is so cool that they're often inundated with comments like "whoah they belong in a movie!" But then, if they ever DID make it into a movie, are we all going to laugh and go "bahahaha that's a Nerf blaster!" YouTube: Black Keys "Howlin For You"
The Black Keys have a very cool video to their song "Howlin' For You" that's made to look like a Grindhouse exploitation flick trailer. YouTube: Bombs Away "Super Soaker" music clip.. ALL about Super Soakers..?! Bombs Away do discuss their video here.